The Linux version of the game uses a wrapper to convert Direct3D 11 calls into OpenGL, which may result in reduced performance. Eastern Europe: Steam key is obtained in Redeem.exe which checks CD-key and DVD authenticity. No DVDs included in North American release. Digital Deluxe Edition. Regular Edition also available. All versions require Steam DRM - additionally all Windows versions use Denuvo Anti-Tamper DRM (Linux and macOS versions do not). The Digital Deluxe Edition includes all the DLC for the game. All consumable items included in DLC are single-use micro-transactions. Exclusive to preorders, the Day One edition and Season Pass. This causes the game to skip both the launcher and the intro videos. Use the Deus Ex: Mankind Divided intro skip. During hacking the node descriptions are cropped off for a 16:9 display. Has been patched to an angle slider as of August 26, 2016. For higher values see Field of view (FOV). MSAA, TAA. For SMAA see Anti-aliasing (AA). 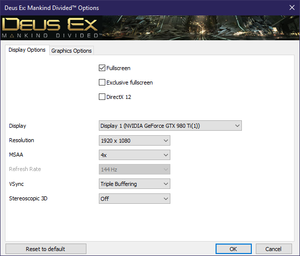 Download Enhanced FoV Settings for DXMD. Download and install Cheat Engine (Square Enix does not ban DX:MD players for use of CE). SMAA anti-aliasing is a lower cost solution for eliminating jaggies that looks better than TAA and gives better performance over MSAA. MSAA can severely reduce FPS on weaker systems while TAA reduces image clarity (and can disorientate some people). X and Y sensitivities can be set separately and the sensitivity range was increased in version 1.1.524.10 (26.08.16). Launcher requires mouse, see skip launcher. Requires the Japanese Language Pack DLC (not available in all regions). 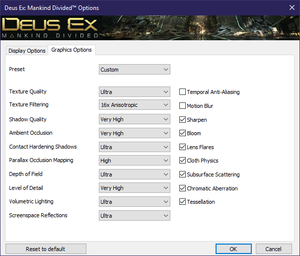 Exclusive Fullscreen must be enabled for DirectX 11 or disabled for DirectX 12. 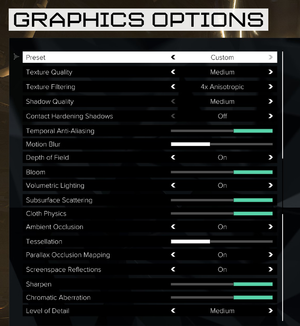 Refer to the GeForce Forums topic for recommended adjustments. Toggling Exclusive Fullscreen mode can mess up the UI on some aspect ratios. Using the inventory permanently reduces all dialog sound to almost inaudible volume. Reload savegame to restore normal audio. This error is caused by the DVD including d3d11.dll Windows 8.1 system library never meant to be shipped in other OS. Insert Disc 1 of the game. If there are still problems use the Support Page to request the Steam key. 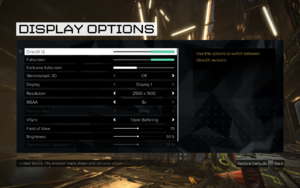 The fix is to turn on exclusive fullscreen. In the settings dialog displayed when launching the the game, turn on "Exclusive fullscreen". "Exclusive fullscreen" appears to be the game's term for _true_ fullscreen, while the game's "Fullscreen" option is actually borderless windowed mode. Due to how it presently works with facial meshes, tessellation can cause character faces to having a strange, "washed out" look to them which makes them look semi-transparent. Disabling tessellation may be undesirable if you wish to keep certain environments from looking too angular. Fix can require re-download of several gigabytes (but not whole game). Go to the game in your Steam library. Uncheck the DLC and wait for it to go greyed out. Check it again so that it will download/install the DLC. Before entering the shooting range itself, empty your inventory, or at least remove the weapons from the inventory. Supposedly, just not interacting with the lockers at the shooting range instead of dropping the inventory works, too. AMD GPUs are not officially supported on Linux. "The game has Denuvo, like other Square Enix games indeed." "Consumables (Praxis Kits, Ammo, Credits, Crafting Parts) are one-time use items [...] they will be 'consumed' in your current playthrough, and not re-usable." ↑ "Before redeeming your Deus Ex: Mankind Divided pre-order bonus, you need to know this". 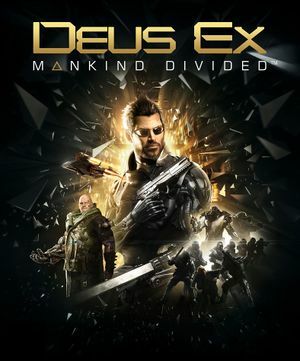 2016-08-24. https://www.vg247.com/2016/08/24/before-redeeming-your-deus-ex-mankind-divided-pre-order-bonus-you-need-to-know-this/. ↑ NeoGAF - View Single Post - Denuvo, are we putting the keys to PC gaming in the hands of an unknown third party? ↑ Steam forum post: "Game crashes on the gun range tutorial"
"Deus Ex: Mankind Divided is coming to Mac using Apple’s Metal graphics API, delivering Deus Ex onto the OS in spectacularly polished form."